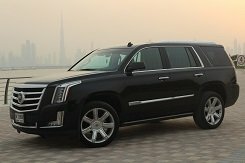 Legendary and luxurious Cadillac Escalade can be rented in Dubai at the best price. Spacious and comfortable salon, powerful engine, off-road qualities and excellent "taxiing" - that's what Cadillac Escaleid is choosing and renting for. Rent Cadillac in Dubai can be from days to months. On the Escalade you can easily go into the desert and ride on the barkhans, because The car is equipped with the most advanced all-wheel drive system. For the city this model, also, is ideal: fast acceleration, remarkable control, despite the dimensions and weight of the car, and an excellent comfortable suspension.